The topical theme is the electronic lock. 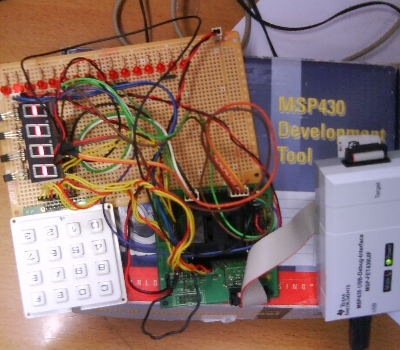 The topics include a 4X4 matrix keyboard, seven lamps, LED lamps and MSP430 chip. We use the IAR the MSP430 integrated development environment Workbench programming, the program has four main parts, the output of the keyboard into the subroutine, the subroutine of the seven lights, set the password and enter a password subroutine, the function of the entire program is storage to an array by the matrix of the keyboard to enter the four-digit password, then enter the locked state, and then enter the four-digit password will be deposited into another array, then the two sets of arrays than if the same Unlock different had no response.